Kelly McDermott - "Achieving her aspirations in Ambergris Caye"
Today we are living in an era of yet another San Pedro generation assuming their respective roles in the business arena. Whether their goal is to be involved in politics, tourism, or business administration, the bottom line is that the younger generation must strive for the best education possible in order to achieve their objectives in life. This week The San Pedro Sun is pleased to feature an exceptional young Belizean who is doing exactly that - Miss Kelly McDermott. Kelly was born on June 23rd, 1978 in Belize City to San Pedro residents Linda and Jerry McDermott. When Kelly was only a day old, the happy couple brought their baby girl home to the island. Sea, sun and surf made up Kelly's playground while she attended San Pedro Roman Catholic School. Prior to completing her elementary school studies, though, Kelly moved to Houston, Texas. Kelly graduated with honors from Houston's St. Agnes Academy in 1996. She then enrolled in the School of Foreign Service at Georgetown University in Washington, D.C. where she majored in Culture and Politics. Kelly chose this course of study following her desire to one day become Belize's Ambassador to the United States; but upon completion of her university studies, she postponed this long-term goal in order to pursue another dream - the Peace Corps. 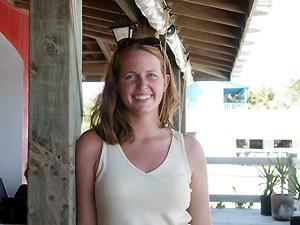 In July of 2000, Kelly joined the Peace Corps in the Dominican Republic. She had always enjoyed traveling and felt that this would give her an opportunity to focus on a future career. In the Dominican Republic, she worked planting banana trees, green peppers and potatoes, but after six months of intense work and poor living conditions (no electricity and limited water supply), Kelly contracted dengue fever and went to Houston to recover. Following her recuperation, Kelly decided it was time to go home to Belize. After enjoying some well-deserved rest and relaxation in San Pedro, Kelly moved once again, back to the US - this time to San Francisco, California. During her stay in the "City by the Bay," Miss McDermott was employed by Hirsch & Associates, an effective philanthropy firm responsible for helping wealthy families and businesses distribute their money to charities. "I enjoyed this job very much," stated Kelly. "It was very rewarding work to give money to worthy causes. It doesn't get better than that," she said. Although life in San Francisco was good, Kelly realized it lacked two very important necessities in her life - the sun and the Caribbean Sea. As fate would have it, Kelly was offered a business partnership in San Pedro and decided to go for it. She quit her job, left her life in California, and returned home to "La Isla Bonita". In November 2001, Kelly teamed up with business partner and executive chef Chris Aycock, and together they opened the Blue Water Grill at the SunBreeze Hotel. While Kelly directs the "front of the house" operations at the restaurant, Chris creates exquisite cuisine and takes care of the back of the house operation. In less than a year, these two have managed to make their eatery one of the most popular restaurants on the island. "The success of the business is due to Chris's expertise in the kitchen, the excellent food he creates, and the friendliness of our staff," Kelly told The San Pedro Sun. Kelly's future plans include obtaining her Master's Degree in International Development and returning home to work with non-governmental organizations, especially those dealing with women's economic independence. Another of her goals is to start a micro business loan program in Belize to assist small business owners by providing them with start-up or expansion capital. In her spare time Kelly still enjoys the sun and sea. Certified as an open water diver, she loves the thrill of this sport. Her other passion for traveling has also led Kelly to several destinations around the world. Not even in the prime of her life, Kelly McDermott has already achieved several of her personal objectives. Without a doubt, her goals for the future will also become reality and soon bring long-term benefits to Belizeans in and around "Our Community."